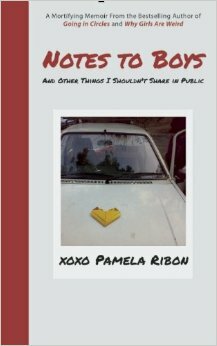 Notes to Boys (And Other Things I Shouldn’t Share in Public) is a “mortifying memoir” from bestselling author and tv/film writer Pamela Ribon. Miserably trapped in small town Texas with no invention of the internet in sight, Ribon spent countless hours of her high school years writing letters to her (often unrequited) crushes. The big question is: Why did she always keep a copy for herself? Wince along with Ribon as she tries to understand exactly how she ever thought she’d win a boy’s heart by writing him a letter that began: “Share with me your soul,” and ends with some remarkably awkward erotica. You’ll come for the incredibly bad poetry, you’ll stay for the incredibly bad poetry about racism. *Notes to Boys* had a cameo appearance on the TV show *You’re the Worst* episode two. It was featured on a staff picks shelf in a bookstore. The protagonist yanks it off the shelf and replaces it with his own novel.